Barnacles Temple Bar House has been with Hostelworld for over 10 years, and it's not too hard to see why. Their 'super nice, helpful and welcoming' and 'hard working' staff 'who go the extra mile' are frequently rated by our guests as one of the best features of the hostel, in the centre of the lively Temple Bar area. Their 24-hour reception and security means you're safe to enjoy Barnacles' free tours and pub crawls. We like that if you can't get to the post office on time, the staff can pop your postcards in the mail for you. I originally booked two nights. My travel plans had changed multiple times due to airline. I emailed Barnacles several times to inquire about changing my reservation. They were very helpful in accommodating me. I asked about public computers to print boarding pass which they didn’t have but were happy to print it for me and have upon my check in. I couldn’t be happier with the staff!!!! The room was stuffy & opening windows, outside noise was loud! Bed was comfortable. Toilet/shower in room. Staff was very friendly and accommodating and was able to assist with new suggestions and directions. The hostel is currently being renovated but that did not damper or hinder the experience! Nice 6 bed dorm with ensuite that was very clean, had overhead lights and powerpoints. Amazing location in temple bar and had breakfast included (decent continental with coffee machine). Stored our luggage easily prior to check in, and easy to get to the airport bus (15minute walk). Great location since it's next to Temple Bar but this also means it's very noisy all night. The rooms were nice and the staff were friendly. It was in a great location. But it was so loud. I sleep with ear plugs in but was woken up in the middle of the night by groups of guys yelling in the hallway and violently banging on the door to our room and the one next to it. Good location, right by the corner of 'the temple bar', but that also means it was pretty noisy at night time with drunk people on the streets (just to keep in mind if that is a problem). The toilet and light in my bathroom wasn't working my first night there but they fixed it on the second day. Only one other communal shower and toilet for the entire hostel. Overall the place was alright for the location and cheap price over the weekdays. Staff were very friendly. If you’re simply looking for a place to stay for a night or two in Temple Bar then this is a pretty good option. The facilities are pretty old though and it just didn’t feel too clean. Seems like mostly groups were staying here so not a lot of opportunity to meet other travelers. But location really can’t be beat. A few reasons this wasnt my favorite hostel: Place needed a serious deep clean. Floors had crumbs, trash and hair everywhere . Our room had an incredibly loud mechanical buzzing noise go off in the walls every thirty minutes and that continued through the night. There was no hand soap in our bathroom and the bathroom light was out. In the middle of the night the fire alarm went off and was turned off after a minute. Horrible experience. Wouldn't recommend. This place is like a massive dungeon in the depths of Temple Bar. Rooms are densely packed with dorm beds and place is so large that it's tough to get a vibe here. The few social rooms were never used. Also tons of drunk weekenders stay here and make a lot of noise. I was woken up in the morning by like 10 dudes all yabbering away in the room for an hour - there wasn't even 10 beds in the room, so no idea where they came from. Not a backpacker vibe. Location, Location , Location! 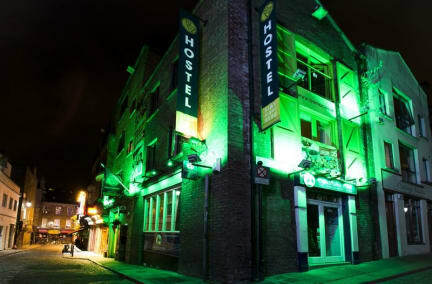 There is no better located hostel in Dublin, right in the heart of hip Temple Bar, Dublin's entertainment centre. When in Dublin, Temple Bar is the best place to experience Irish culture, a variety of pubs and night clubs as well as restaurants and cultural attractions. Together with great value and security we also provide: FREE breakfast FREE walking tour of Dublin FREE wifi, FREE linen, 15 Mins FREE internet and discounts in many pubs and clubs. We are particularly proud of the great compliments and awesome staff reviews we keep getting - fab people working here set us apart from the rest.